Shearing season is starting soon. We had a very nasty winter on Vancouver this year (would be considered very mild for the rest of Canada). We had lots of snow compared to the 1 to 7 days of snow we normally have. All the breeders decided to move their shearing dates to end of April and beginning of May. 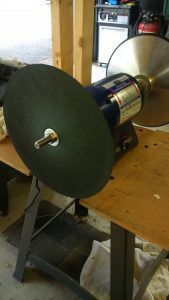 I am preparing my equipment and one important activity is shear blade sharpening. 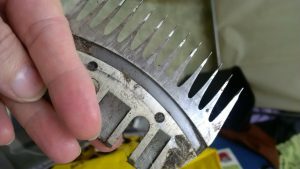 The blades on the alpaca or sheep shear are called comb and cutter. The comb is fixed and the cutter travels against the comb. I use 13 teeth combs. The cutters have 4 teeth. The shear blades are very oily after use. When shearing sheep, the oily substance is lanoline naturally present in the sheep fiber. When shearing alpaca, the shearer must add oil to keep the blades cool. Alpaca fleece does not have oil. Cleaning is straight forward. Put the combs and cutters in hot water with soft soap. I use either dish washing soap or LOC multipurpose cleaner from Amway. Manually clean each blade and dry using a soft towel. I put all the blades sharp side up on a table. Since the oil is gone, the blades will rust fast so they must be sharpened immediately. The first few years I was shearing alpacas, I had to find someone to sharpen my blades. I had about 15 sets and I was running out of blades after a few farms. Sharpening is a trade and sharpening well is rare. I tried a couple of places on the Island and I was not happy with the results. I went back to my friends in Calgary where I learn shearing. They recommended me to buy my own equipment. If you live in Europe, you can easily find great equipment from Heiniger and other shear manufacturers. In US, you can get the blades sharpen by Premier 1. In Canada, there is no such service so I bought a motor and the Heiniger plates. I also got a pendulum and coarse and fine emery paper. The pendulum has two sides: combs and cutters. Cutters are made of a softer metal and we sharpen them using the fine emery paper. I set the cutter on the cutter side of the pendulum. The cutter lies flat on the plate and must not be grinded for more than 2 seconds. I sharpen everything twice. Combs are sharpen using the coarse emery paper. I set the comb on the combs side on the pendulum. 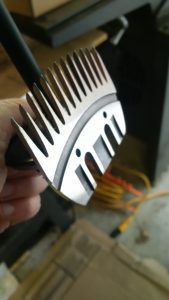 As the comb is moved towards the plate, the bottom part of the blade will touch first. I use the full width of the plate so the blade is sharpened evenly. 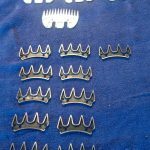 I now own 40 sets of combs and cutters and I sharpened them once or twice per season. When all the blades are sharp, I spray WD40 on them and make sure all the surfaces are covered. I can then wrap the blades in plastic and put them back in the shearing kit. If you have questions or comments, please feel free to leave them below.